Image caption If the US strikes, what then? 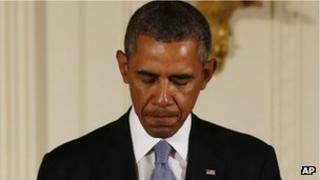 President Barack Obama says he has made no decision on military action. But he's pretty clear what it might be and what it won't be. Speaking to PBS Newshour, he said any action would be "tailored", "limited" and intended to send a signal to the Syrian government to discourage them from using chemical weapons again. But he also said he had decided against "direct military engagement", adding: "I have no interest in any kind of open-ended conflict in Syria" and spoke of "not getting drawn into a long conflict, not a repetition of Iraq". There is no doubt that is not just Mr Obama's view - it is a heartfelt plea by a military involved in 10 years of war. But it raises a lot of questions. What action sends a message to Bashar al-Assad, but does not loosen his grip on power? A couple of cruise missiles? Three days of air attacks? The destruction of air bases? The most obvious response, on the chemical weapons bases themselves, has apparently been ruled out by most experts because it would simply disperse the deadly agents far and wide. It is obvious that when President George W Bush declared war on Afghanistan he didn't expect troops to still be there more than a decade later. Yet it happened. The slope to war is very slippery. Of course in one sense it is relatively easy for Mr Obama not to get dragged in. He could order one attack and refuse to do any more. But that could leave him looking weak, his action a hollow symbol. There could be retaliation. Mr Assad could be more determined than before. By declaring that he will avoid a long conflict Mr Obama could be unintentionally signalling to him that this is a one-off punishment, not a response that could escalate to match the regime's actions. One source, deeply involved, told me an important part of the discussions was exactly that: "Something needs to be done, but what is the impact? What is a surgical strike for? If Assad does it again what do you do? What is the ultimate action?